These borders are inspired by cross stitch borders which are part of randje per week 2015 challenge. edge # 9 inspired this kutchwork border. The pattern was drawn on inch graph paper. 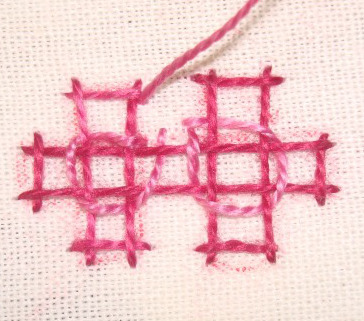 The anchoring stitch can be worked continuously for this border. Starting point. 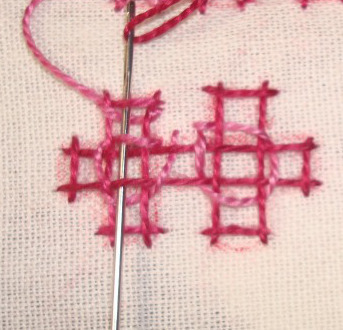 The needle goes over the previous stitch in the next square. 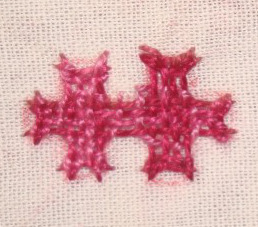 The next stitch requires the needle to go under the previous stitch as seen here. We go under and over the stitch alternatively on adjacent squares. 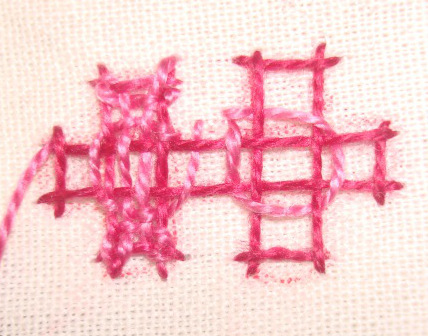 The basic pattern determines the route of the anchoring stitch. While returning, two things are important. Remember to go under or over the previous stitch as the case may be at the point where the needle enters the fabric and at the point where it crosses previously worked line. This fixes the interlacing stitch in its place. Completing the left over points. It is seen that the return journey touches all the points marked, this means the anchoring stitch is continuous. One side of the border gets interlaced in one journey. While we return, we’ll interlace the other side. Sometimes I do free hand kutchwork designing. The same border idea is repeated in this free hand border. Most of the ethnic pieces have this type of kutchwork. The pattern of one element of the border. This is just an attempt, the same thing can be repeated to make full border. 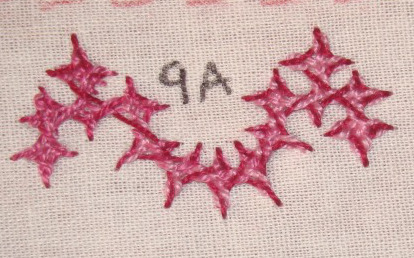 The anchoring stitch, notice how the points are worked at angles to get the effect of a curve. 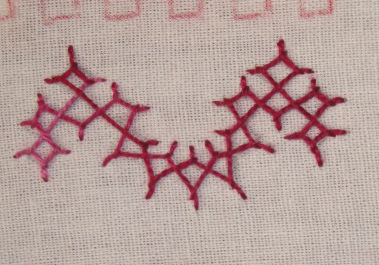 the stitches move along the pattern drawn without disturbing the shape. The interlacing is simple in these type of free drawn designs. This border is inspired from edge #10 on randje per week 2015 challenge. To start the anchoring stitches we’ll start with the vertical bars, because they are shorter. They need to be worked individually, we’ll jump from one bar to another, saving time on cutting the thread. The bars are completed by jumping from one bar to another on the return journey. Starting with the horizontal bar, the needle moves up and down alternatively over the vertical bars. 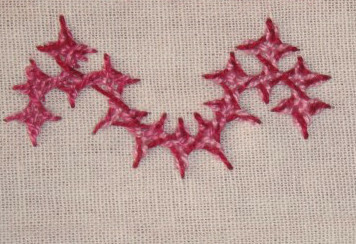 The anchoring stitches are completed. In this design the interlacing around the square made where the bars cross has to be done separately, these places around the squares get neglected. The extra interlacing lines are completed. After this the interlacing is piece of cake. Working in one direction , one side of the design gets interlaced. Returning the other side also gets interlaced. Thus completing this border. The same design is tried in woven kutch work. The pattern. The first three steps are the same. Weaving on the vertical bar. After completing the weaving on one bar, moving on to the weaving of the horizontal bar. The horizontal bar is weaved. 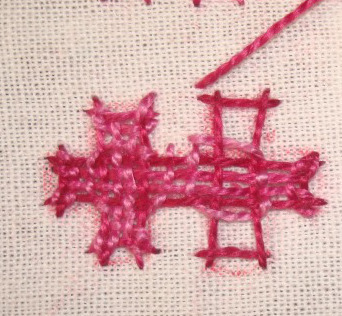 While working on the border 10, another way of working this border in kutchwork came to mind. This is simple kutch work deign. 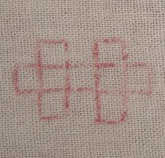 The anchoring stitch. The anchoring stitch is completed. This version of the border looks like this after the interlacing.